Stephen John Owen was born in Caernarfon in 1959 although he now lives and works in Groeslon. He is a self taught artist whose work has been greatly influenced by his upbringing, both in Caernarfon and Church Bay Anglesey. As a child, he spent many a long school summer holiday on the Island at his grandmaothers home. In later years, as a young man the urban images of Caernarfon were a great influence and are clearly expressed in his art work. He enjoyed art as a subject at school and was influenced and encouraged to paint by his art teacher William Selwyn. Stephen has his own unique style of painting his passion continues to evolve and develop and he is constantly seeking inspiration from his surroundings. His subject, and his inspiration has always been the landscape and rural environment that surrounds him, that formed him. 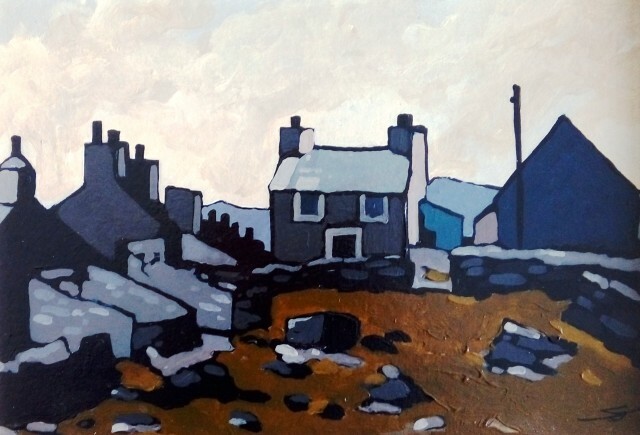 He captures the particular character of the villages, farms and old quarrymen's cottages that have surrounded him all his life simply and sincerely. He invests these familiar and often lowly scenes with dignity and humanity. He paints with an immediacy and openness that clearly articulates his sincere love for and connection with his subject. The colours and the specific tone of the light and the weather, and the shapes and forms of the architecture and the landscape are familiar and deftly caught. He gives them freshness and vitality. He is able to refine what he sees, simplifying it in order to reveal its essence, its core, its spirit. Stephen John Owen has had two previous sell out exhibitions with us and exhibited again in June 2017. He returned with a major solo exhibition to celebrate his 60th birthday in February 2019.